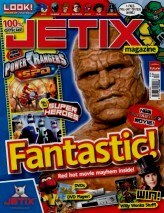 The latest generation of Power Rangers gets its UK debut in Jetix Magazine issue 12, on sale Thursday 14th July. Transformers comic strips for Marvel UK in the 1980s and also the recent Dreamwave Transformers comic series. Emperor Grumm’s assault on Planet Earth. Editor Cavan Scott said: “It’s fantastic to have Simon creating the first comic strip adventures of Power Rangers SPD. If you’re a fan of Space Patrol Delta you’ll love these brand new adventures of all your favourite characters! Issue 15 of Jetix Magazine will also feature the first episode of Power Rangers SPD on its free cover-mounted DVD. Every month the DVD features episodes of top Jetix shows plus games trailers, puzzles, trivia and PC downloads. Jetix is an action-packed magazine for kids who love cool cartoons plus all the latest toys and games. Teenage Mutant Ninja Turtles, Power Rangers, Spiderman and Sonic X.
the PC to download cool playable game demos, wallpapers and screensavers. Thanks to Cavan Scott, Editor of the Jetix magazine for this press release. Visit our Jetix Magazine section for info on the previous issues.